Don’t feel like shoveling? JFK’s snow removal professionals are here to help! We are currently in the midst of the winter season. If you haven’t already heard, the groundhog saw his shadow this year. Most people would consider this news to be rather unfortunate because it means we have to endure six more weeks of cold weather. Many homeowners are unaware of the significance of winter landscaping. You may be surprised to learn how you can enhance the appearance of your property this time of the year. Also, it is important to remember that Spring will be here before you know it, and there are several steps you can take to prep your property for warmer weather. Here are a few winter landscaping tips to help you this winter season! Every yard should have some focal points. Winter is the dormant season for many plant species, which makes it the perfect time to determine if your yard lacks any real focal points. Since most front and backyards are rather bare, it is easier to envision your property’s potential during winter. You may realize that your yard could benefit from a small patio, a walkway, a fence, or a retaining wall. There is no reason why you need to wait until spring to complete one of these projects! If you were to higher a contractor, you would likely get a better deal because they tend to have more availability this time of the year. Winter weather and lawn furniture don’t exactly go together. If you haven’t already, it is in your best interest to either cover them up with a tarp or bring them inside your shed, basement, or garage. By doing so, you will help ensure the longevity of your furniture. Don’t be one of the many homeowners who neglect to prune their trees and shrubs during the winter season. Proper pruning will not only improve the appearance of your trees and shrubs but can also make them healthier as well. It is best to remove any diseased or damaged branches this time of the year. 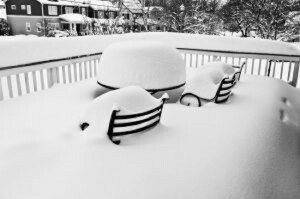 Maryland and other states in the Mid-Atlantic region can always expect a few snowstorms every year. If you have trees or plants on your property, you need to keep in mind that an accumulation of snow on branches can easily cause damage. It is worth spending some time to brush the snow off of your trees and plants. Also, don’t forget to take advantage of JFK Lawn and Landscape’s residential snow removal services! This entry was posted on Thursday, February 1st, 2018 at 9:39 am. Both comments and pings are currently closed.